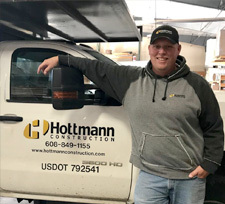 Dave started in the construction industry in 1995 and joined Hottmann two years later. He began as a laborer and eventually took on the role of wall foreman. In 2017, he became a project manager. Dave holds World of Concrete certificates in business and project management and is a Dale Carnegie Skills for Success graduate. When not at Hottmann, Dave volunteers with his kids’ sports teams and tries to be outside as much as possible camping and hunting. He also looks forward to maple syrup season every year.